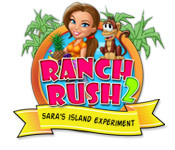 Ranch Rush 2 - Sara's Island Experiment is rated 4.9 out of 5 by 17. Rated 5 out of 5 by zzmama from Super Addictive I love this game! so fun and the kids love it too!! Rated 5 out of 5 by familylong from fun thinking time I enjoyed the graphics and the story line. The wacky scientist was great! I really had to do some thinking. Some of the levels I had to do a couple of times, but I got them figured it out! I recommend this game if you enjoy time management games. Rated 5 out of 5 by 61izzard from One of the best games that we've found at big fish Graphics were clear and crisp, color was great, characters, sound etc....all pleasant. Challenge levels were perfect. Expert was rough but totally do-able with planning. Entertaining. We hope for RR3. In the meantime, this will be replayed from time to time. No rush for the new Ranch Rush because we hope for it to be as perfect as the first two. Nice Job. Clearly, heart and soul was poured into it's creation. Where will the next one be? Russia, Africa, Australia... or where ? Rated 5 out of 5 by mildaplotkin from Quite possibly the best This is probably my favorite time management/strategy game. 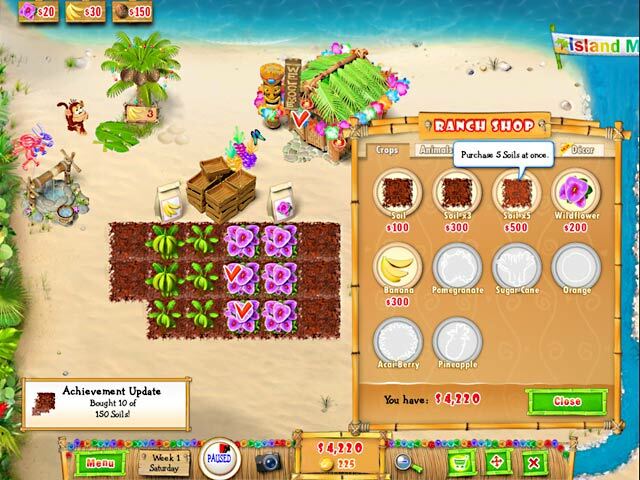 It's very challenging, but so fun to see if you can set up your farm to be able to complete all levels! Great game play, graphics, music, challenge, EVERYTHING. Awesome game! Rated 5 out of 5 by smooches2 from Great game I love the rush! This game has really challenged me to be fast and organized at the same time! Awesome game! Rated 5 out of 5 by firefrog4 from GREAT game! After playing (and loving) the original version, I waited a loooong time for the sequel. I was not disappointed with Island Experiment. Fantastic game, characters (here's a banana, Coco!) music and graphics. So much fun to play but challenging too. My only complaint is that they don't come out with a new version every month. I am getting way too much accomplished at work. PLEASE MAKE MORE RANCH RUSH! Rated 5 out of 5 by bago14 from It's a really great game ! This game is very interesting and never boring! I quickly became addicted to this game ! Very good graphics. No one can hate this game ! Rated 5 out of 5 by GrrlScientist from best time management game i've played yet like ranch rush, which this game resembles, this game is extremely carefully thought-out and executed. the graphics are cute and nicely designed, the sound is great, the voice is nice to listen to (but not annoyingly chatty), and there are so many possibilities for how to set up the "farm" that the game just doesn't get boring. unlike many games i've played, which are designed to make you figure out EXACTLY which steps the designer had in mind and to execute those steps in PRECISELY the correct order OR ELSE, there are a number of approaches that you can use to progress from one level to the next in this game. all my comments for "ranch rush" apply here, too. addictive to play, but in a fun and engaging way. a most pleasant adrenaline rush. Rated 5 out of 5 by Hammhocks from So fun and addictive! I am absolutely in love with this game! I have re-played it several times and keep going back for more. :) I like being able to choose to play in regular or expert mode. (I am still working on the challenge of completing expert mode without failing an order.) One thing I really like about this Time Management (TM) game, vs. some others, is that I can set up my "play field" however I want. 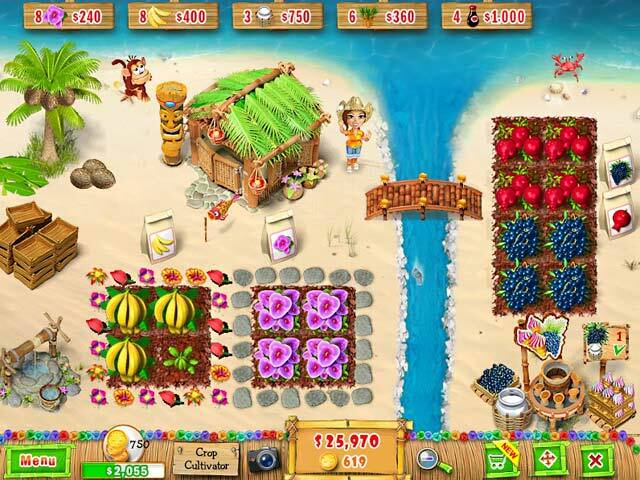 You want 3 banana crops? Great! You want 13? Great! It's your choice. The graphics are really cute. And just wait til you have an encounter with a goat or a duck. ;) Besides the daily orders to fill, two days of the week bring something a little different. 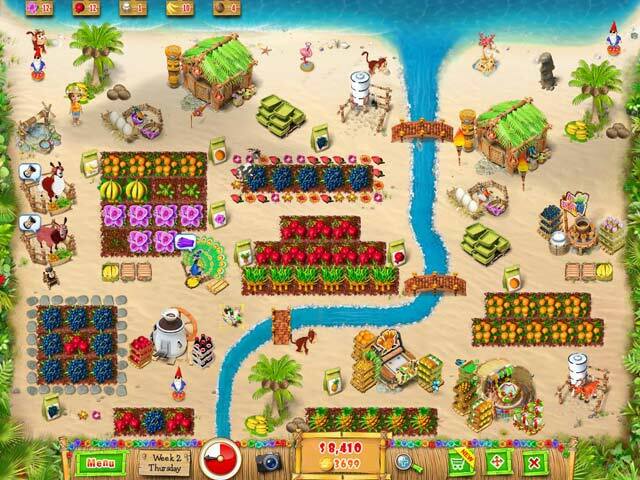 At the "Island Market" you can earn extra money or you can use it to plan ahead. There's also a fishing day. It's a cute little break from the daily farming. The one, and probably only, thing I don't like about this game is that some of the trophies can only be accomplished with the Collector's Edition (CE). The CE also includes a Free Play mode. I'm honestly thinking of upgrading to the CE simply because I love this game so much. Rated 5 out of 5 by MICHELLE_SMYLES from Addictive Fast-Paced Gameplay Cute graphics, challenging game play. Only thing I didn't like was not being able to go back and repeat a level once it was passed. Also appreciated the underlying storyline message about the Heroine growing natural foods and the bad guy being someone who was promoting a miracle weight-loss pill. Great message for the younger audience.